T/5 Wilson Calloway, son of Mr. and Mrs. A. J. Calloway, graduated from Hollister High School. 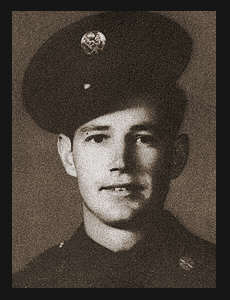 Entered the Army in 1940, trained in Ft. Sill, Okla., Ft. Ord, Ft. San Luis Obispo, Cal. ; went overseas in 1943; served in Aleutians, Hawaii, the Philippines, Guam, Saipan, Okinawa. Awarded Good Conduct Medal, Philippine Lib. Ribbon with two Battle Stars, Asiatic Pacific Ribbon with four Battle Stars, Am. Defense Ribbon.